The St. Croix River winds its way through wild and scenic countryside from its origin in a Spruce-Tamarack swamp near Upper St. Croix Lake. The waters of the Namekagon join the St. Croix 45 miles upstream from this sign. The river system varies from swift and rocky whitewater to placid flowages enroute to the dam 36 miles south, at St. Croix Falls. Historically, the river system was a major highway to native Americans, voyageurs, explorers, missionaries, and loggers. The Santee Sioux and Chippewa tribes fought repeatedly for possession of the valuable rice lakes in the St. Croix basin - a war which was to last well into the nineteenth century. During the 1700's and 1800's numerous outposts along the waterways in quest of control of the profitable fur trade. With the depletion of the beaver in the 1830's, an 80-year logging era began in the pineries along the river. The Governor Knowles State Forest, established in 1970, and the St. Croix National Scenic Riverway created in 1968, provide protection for this valuable resource. Many thousands of people each year enjoy the recreational opportunities provided on the riverway and the state forest. The Northern States Power Company played a key role in the establishment of the National Scenic Riverway and the state forest by the donation of 25,000 acres of land. 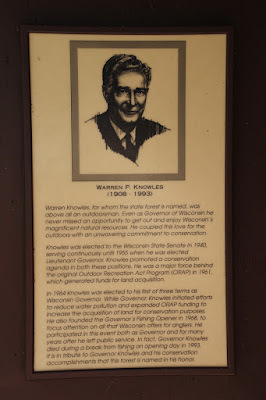 The marker is located at a wayside at the entrance to Governor Knowles State Forest / St. Croix Campground, and is accessible from eastbound Wisconsin State Highway 70, west of its intersection with Grabel Pit Road, at or near 15425 State Highway 70, Grantsburg, Wisconsin 54840. The Governor Knowles State Forest is located in northwestern Wisconsin in Burnett and Polk Counties. It lies along the St. Croix National Scenic Riverway and encompasses approximately 34,000 acres (of which about 21,000 acres are state owned). The property's headquarters is located in the Village of Grantsburg. The forest is perhaps most well-known for its proximity to the St. Croix River. Most of the 55 mile length of the long and narrow property lies along the St. Croix which is designated a National Scenic Riverway. 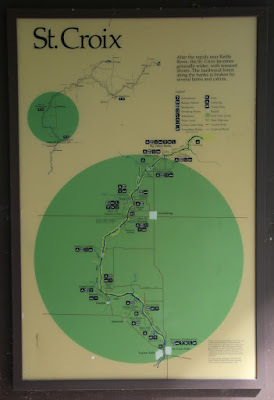 The National Park Service manages the majority of the recreational facilities directly along the river. The St. Croix and Namekagon Rivers offer 255 miles of clean water gliding or rushing past a lush green landscape, with glimpses of human presence. Choose to canoe and camp amid the Northwoods, or boat and fish surrounded by wooded bluffs and historic towns. This river corridor provides bountiful scenic views and a haven for wildlife near a major metropolitan area. Plan a visit! Warren Knowles, for whom the state forest is named, was above all an outdoorsman. Even as Governor of Wisconsin he never missed an opportunity to get out and enjoy Wisconsin’s magnificent natural resources. He coupled this love for the outdoors with an unwavering commitment to conservation. 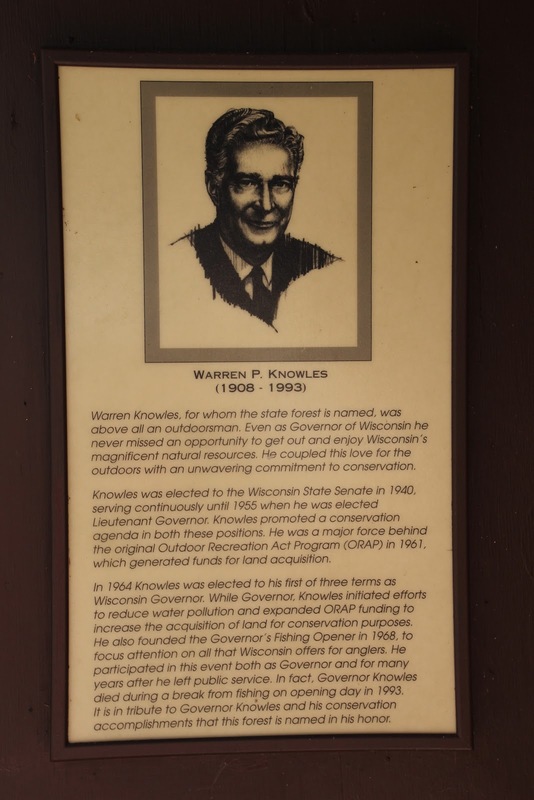 Knowles was elected to the Wisconsin State Senate in 1940, serving continuously until 1955 when he was elected Lieutenant Governor. Knowles promoted a conservation agenda in both of these positions. He was a major force behind the original Outdoor Recreation Act Program (ORAP) in 1961, which generated funds for land acquisition. In 1964 Knowles was elected to his first of three terms as Wisconsin Governor. While Governor, Knowles initiated efforts to reduce water pollution and expanded ORAP funding to increase the acquisition of land for conservation purposes. He also founded the Governor’s Fishing Opener in 1968, to focus attention on all that Wisconsin offers for anglers. He participated in this event both as Governor and for many years after he left public service. In fact, Governor Knowles died during a break from fishing on opening day in 1993. It is in tribute to Governor Knowles and his conservation accomplishments that this forest is named in his honor. The marker is at the Wayside -- follow the signs . . .
the Governor Knowles State Forest. The marker is located in Governor Knowles State Forest. The marker is located in Grantsburg, Wisconsin.